14th Jan. 2016 Yesterday evening I returned home to be greeted by my local Fine Gael TD out canvassing for votes in the upcoming election. Fine Gael needs my help ( my vote ) to get re elected in 2016. 1985 My uncle Fr Niall Molloy was murdered in Clara Co. Offaly. My family felt naively that under a Fine Gael Government that his death would be investigated properly.We were wrong, very wrong. 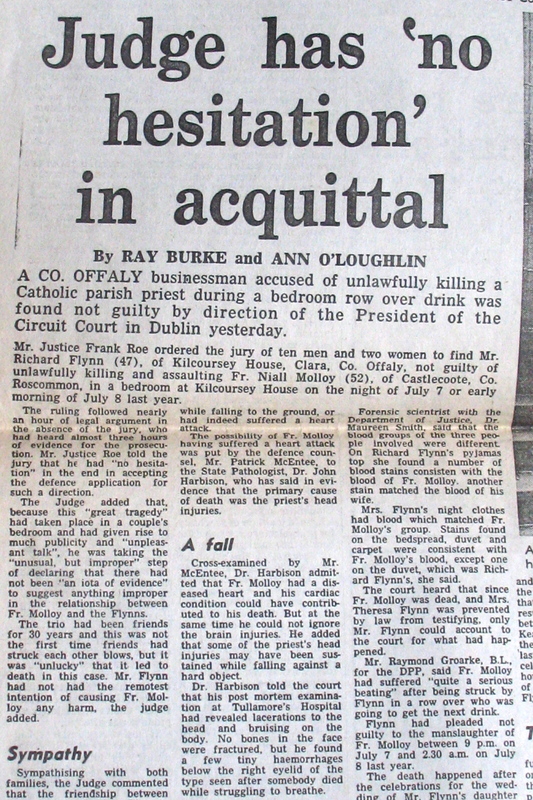 1986 Was the year of the trial of Richard Flynn. He was never arrested but simply ordered to appear in Court to answer charges. The Judge ( Judge Roe ) dismissed the Jury on the grounds that Niall could have died from a heart attack. There were a lot of protests at the time regarding the trial but we were assured that the Inquest would answer many questions that for the family. Fast forward to my meeting Alan Shatter who gave me some encouragement when in opposition but refused to meet the family when he became Minister for Justice. Various inquiries were made over recent years. A review was held into those inquiries bur the SC in charge did not speak to the family. We objected to the Terms of Reference but our objections fell on deaf ears. We asked for meeting with both Alan Shatter and Frances Fitzgerald but were refused. She did seem interested when I told her that my grandfather W J Molloy served as a Senator from 1922 – 1931. Many of my family including myself had voted for Fine Gael for most of our lives. We were not begging them for help we just expected Justice would be done while they were in power. We expected that from them and we trusted them with our votes. 2016 NOW THEY ARE BACK AT MY DOOR ASKING ME FOR MY TRUST AND MY VOTE. Now Fine Gael wants MY help. Senior Fianna Fail politicians were not present at an after-wedding party at Kilcoursey House on the night that Fr Niall Molloy was killed in July 1985, Senator Terry Leyden has said. Senator Leyden was speaking at a public meeting in Castlecoote last week, where renewed calls were made for an independent commission of investigation into the circumstances surrounding Fr Molloy’s death. The Castlecoote-based senator and parishioner dismissed ‘allegations’ that the late Brian Lenihan, then a senior party figure, and his wife Ann, had been present at Kilcoursey House on the night of Fr Molloy’s death. “Minister Brian Lenihan and his wife Ann were present at the wedding; that is true. … They left on Saturday evening at six or seven o’clock and I checked this today with Ann Lenihan and she wants me to say that tonight,” Senator Leyden told the meeting last week. “They were not present on the Sunday, which has been alleged by some journalists,” he added. Senator Leyden subsequently confirmed to the Herald that no Fianna Fail politician to his knowledge was present at Kilcoursey House on the night of Fr Molloy’s murder and he also dismissed any speculation of a political cover-up. Indeed the Fianna Fail Senator pointed the finger instead at the judiciary and church when he spoke at the public meeting in his local parish hall last week. 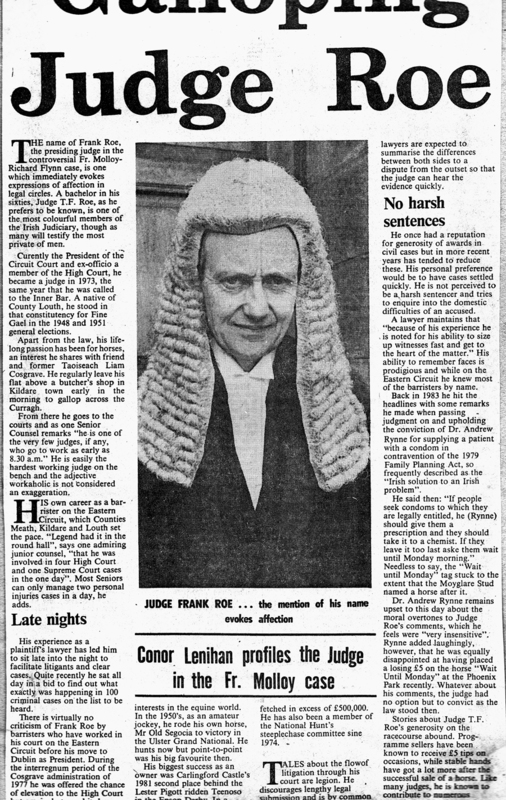 Senator Leyden said that revelations in more recent years indicated that Justice Frank Roe, now deceased, should never have heard the criminal trial that followed Fr Molloy’s death. “He knew the family involved and should never have taken the case, that’s absolutely right … alone that much would require a public inquiry,” he said. He said that the church hierarchy had sought to “hush-up” the Fr Molloy case and refuted any political involvement: “It was the judiciary and the hierarchy that were involved in this case as opposed to politicians, which it is alleged. Politicians were not involved to my knowledge”. 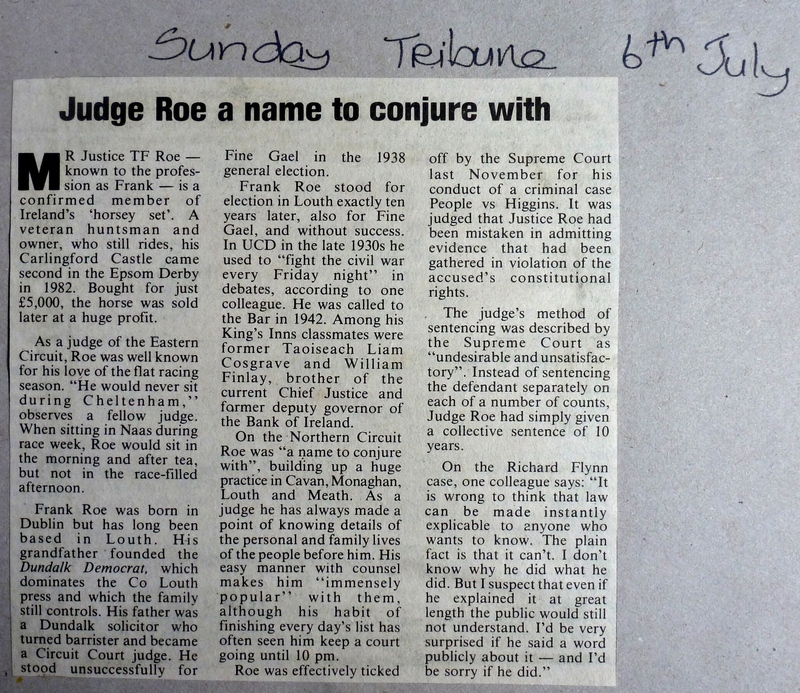 Senator Leyden further told the meeting that he questioned Justice Roe following the acquittal of Richard Flynn for the manslaughter of Fr Molloy in 1986. Judge Roe, he said, had indicated that a doubt had been raised over the cause of death during evidence from state pathologist Professor John Harbison. Under cross examination Professor Harbison had conceded that it was possible that a heart condition may have contributed to Fr Molloy’s death. This, Senator Leyden told the meeting, was Judge Roe’s “out” from the trial: “When Roe got that word, Roe was out. He knew how to get out”. The Fianna Fail stalwart also said that it was generally accepted that “the wrong man was on trial” for Fr Molloy’s death. Meanwhile Senator Leyden indicated that he had recently raised the Fr Molloy case with Minister Michael Noonan, who had been Minister for Justice at the time of the Castlecoote priest’s death. The Fianna Fail Senator revealed that Minister Noonan had registered some concerns about the case with the Secretary General of the Department of Justice some time after Fr Molloy’s death. “He was told by a TD from Laois/Offaly at the time that no-one ever will stand trial for this murder. I won’t name that person now but the Minister told me himself. He was so concerned he went to the Secretary General of the Department of Justice to report what was said to him,” Senator Leyden said. Since last week’s meeting Senator Leyden clarified that he did not have any evidence to offer in the case but he pledged his full support for an independent commission of investigation into the circumstances surrounding Fr Molloy’s death 28 years ago.